I’m sure you’re all aware of the dangers of a CVS run, right? Last week, I stopped by CVS for a quick trip to get some cleaning supplies. I’ve just moved into my new office space, and it was pretty dang dirty, so I needed to rush out right away and get cleaning spray, wipes, paper towels, the works. I was only going to pop in for a second. But you know, CVS has the best stuff. Makeup and hair stuff and gel pens, oh my. And have I mentioned the bags of candy? Yep, I walked out of there with snack-sized Reese’s, Mega M & Ms and yes, fun-sized Snickers. Rather than eat the entire contents of each bag immediately while I cleaned dried-up Jolly Ranchers off a desk in the office, I chose to save them and bake this candy bar brownie cake instead. This past week, I went to cake decorating class. I originally signed up for this class before my job promotion when summer was supposed to be uneventful and relaxing, and now I just don’t know if I can do it. I was sitting in class at night trying to form a fondant and gum paste flower, and the table was making waves in front of me. I was about two seconds from face-planting onto my sugar daisy. Fondant is a tricky beast, for those of you who work with it. It’s like play-doh, except it theoretically tastes a little better. I know it looks really nice, and I like making decorations with it. That said, I’ve never been the biggest fondant fan. For one thing, it doesn’t taste as good as frosting. For another, it really gets handled a lot. I know (or hope) that bakers are working with really clean hands, but the image of someone handling something that much before I put it in my mouth is a turnoff. Also, the stuff cracks really easily, and once that happens, there’s no fix. I know we’re into this whole smooth cake trend, and it’s totally pretty. But I get frustrated sometimes at all the fondant cakes that look alike. Or maybe that’s just me looking for an excuse to drop cake decorating class so I can get more sleep. For the first time this week, I’ll be making a tiered cake. I’ll let you know how that goes. Send me tips, okay? I’ve chosen to frost it as a mostly-naked cake to keep the work down to a minimum, but boy, I’m scared. When I’m trying new things in the cake decorating world, it’s nice to make a dessert that it low-maintenance and no-fuss. This brownie cake is exactly that. 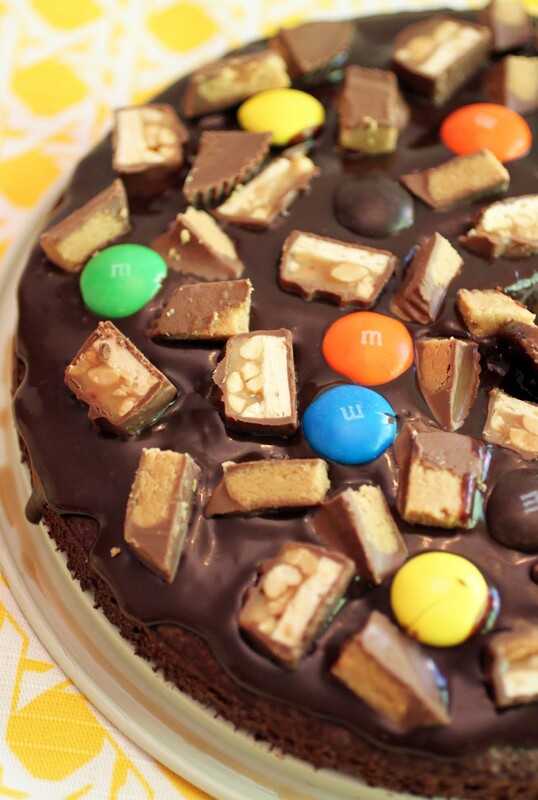 The base is a fudgy brownie, covered with easy chocolate ganache and topped with my CVS collection of chocolate bars. Could life get any sweeter? And now I’m off to try and dowel some cake. Wish me luck! I’ll be stopping by here for therapy if things don’t go well. Have a great start to your week, everyone! In a medium-sized bowl, mix the cocoa into the melted butter until it dissolves. Add the sugar and stir again. When the sugar is incorporated, mix in the vanilla and eggs. Add the salt and flour, mixing until just combined. Pour the batter into the prepared pan and bake for 25-30 minutes until set. Cool completely. While the brownie cake is cooling, make the ganache.Heat the heavy cream and chocolate chips in the microwave for one minute. Stir until smooth. Release the cake from the springform sides. Slowly pour the ganache over the cake, edging it gently out to the perimeter of the cake. Stop when the cake is covered. Sprinkle the chopped candy bars on top. Chill for an hour until the ganache is set. Slice into wedges and serve, or store covered. The patriotic treats continue! Let’s get them all in there before Independence Day! This time of year, I’m usually basking in summer with not much to do. But thanks to a recent job promotion, I’m burning the candle at both ends. I wake up, work, work some more, and that’s kind of how it is. But at least the sun is shining! And I have these to sustain me. 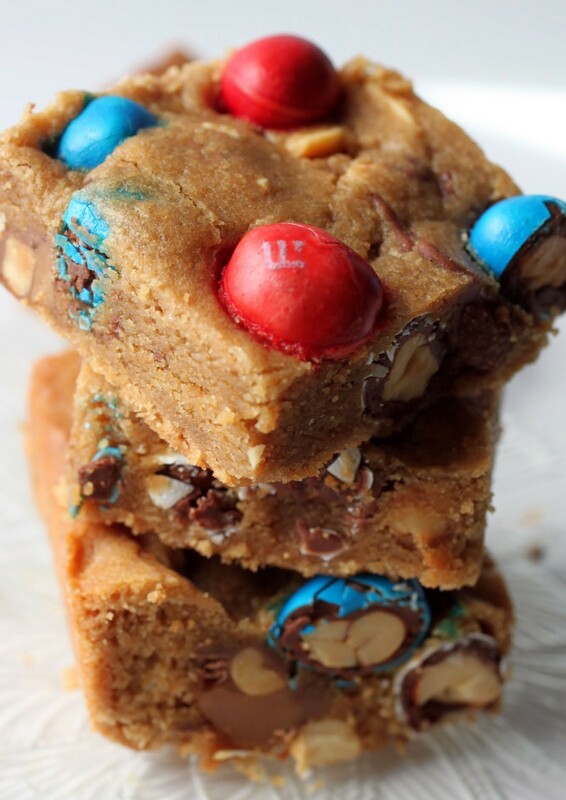 The base is my favorite flourless peanut butter cookie dough filled with my even more favorite candy aisle choices: patriotic peanut M & Ms and Baby Ruth bars. Heck yeah! My entire childhood was devoid of butter. I mean, there was good reason for it. When my father had a triple bypass relatively early in my life, my mother overhauled the kitchen. If there had been butter before, it was gone forever. So I never knew what it tasted like, much less how it could elevate a baked good. Believe me, I’m making up for lost time here. 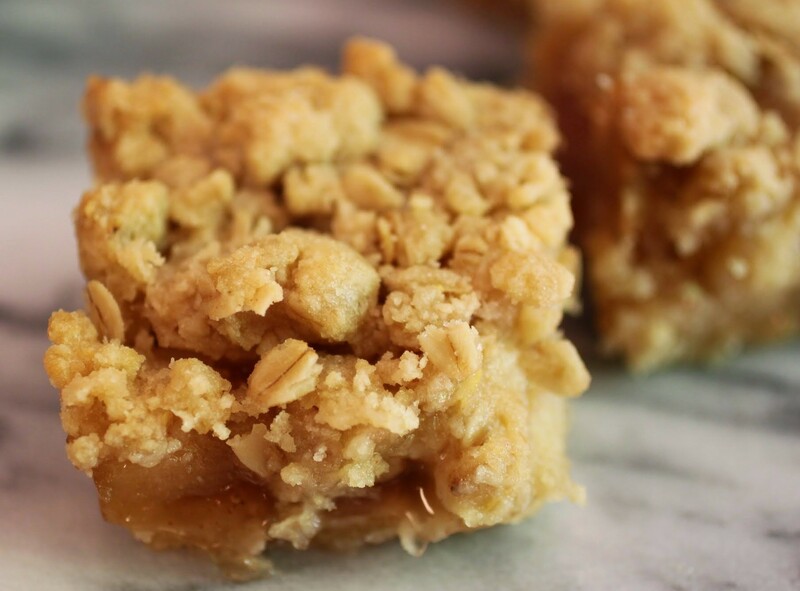 This is my favorite cookie bar base, which has very few ingredients, so it’s easy to throw together as well as delicious. 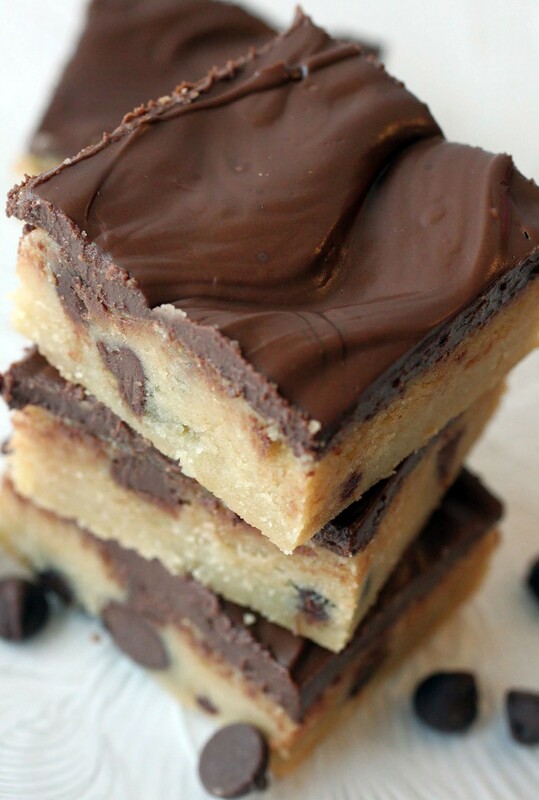 I’ve filled it with milk chocolate chips and spread melted milk chocolate on top. Really, life doesn’t get much better than this. Did you know that you can hire someone to help your kid stop sucking his thumb? Until about a month ago, my son was a die-hard thumb sucker. He was just super attached to it. And when he didn’t have a thumb in his mouth, his shirt collar worked, too. I was getting tired of all the damp, stretched out shirt collars. Not to mention the thought of orthodontia bills down the road! Our dentist connected us with a miracle worker I call The Thumb Lady, and now he’s habit-free! And since he’s not putting his thumb in his mouth, he now has space for other things. Like these amazing bars. Me too. I keep picking off the candy! I took a whole series of cake decorating classes, but never made it to fondant. Let’s just say I was not at the top of my class 😉 My cakes were OK, but nothing like my classmates. I better just stick to cakes like this – you can never go wrong with candy toppings! It’s much easier to do cakes like this! The ones with frosting and fondant are TOUGH. Kate @ Framed Cooks recently posted…Lillian’s Cheese Dip, and a Giveaway! It’s going okay. I’ve built it, and now I have to make sure it’s all even! Target is my weak spot, like CVS is for you. I can’t walk out of there without spending at least $50! 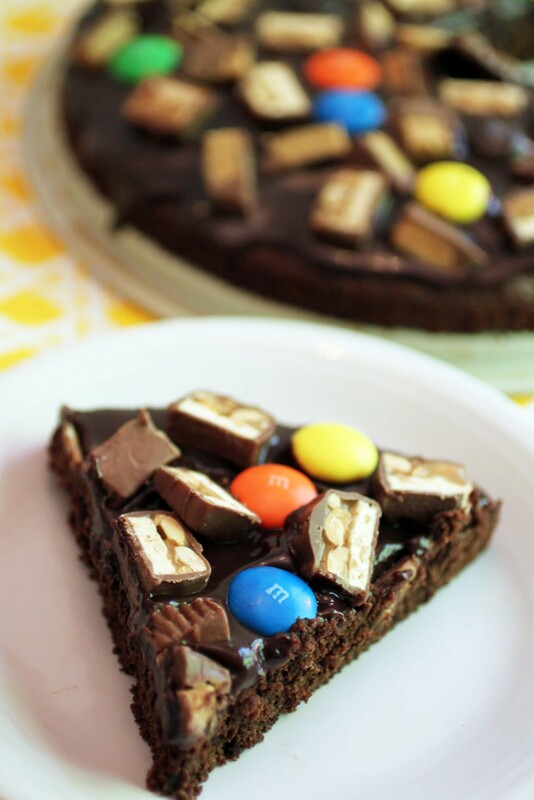 This brownie cake looks SO good, Mir! I love the candy on top! Hey, Target is totally also my weak spot. They’re both amazing places! I am so behind in reading blogs…and I have missed so much yum from you! I could go to town on this brownie, and I never leave any store without bags of candy. Also, a cake decorating class. I could never do it, I don’t have the patience! I’m patient, but it’s tough to make the flowers look like flowers. I can’t do that! I always get candy when I go to CVS/Walgreens 🙂 This brownie cake looks gorgeous! I do need to make it asap! Yay to your new office and job promotion, Mir!!! I’m seriously SO thrilled for you!! Okay, CVS = DANGEROUS! Lol. I could roam around there for at least 30 minutes and spend more money than I care to admit in record time. 😉 WHY do they have all the things? It’s like a small scale target.. that place is dangerous too! 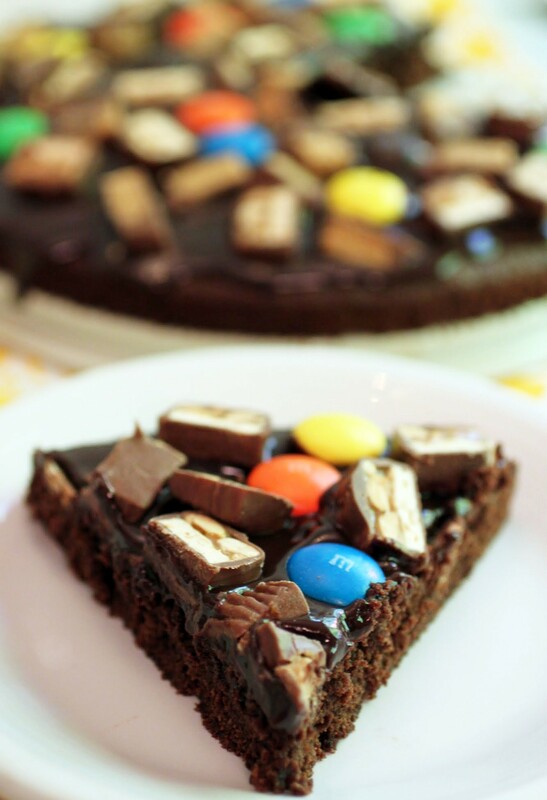 Anyways, LOVE that you used the mini candies to make a candy bar brownie cake!! I see a common thread going on here – DANGER. 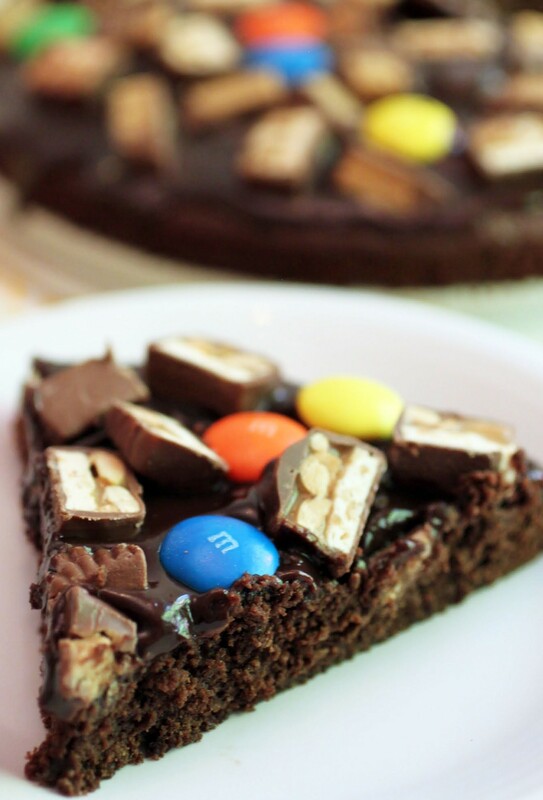 NO way could anyone eat just one slice of this brownie beauty! Perfectly decadent and delish, girlfriend! Cheers! It’s just like a small Target! And I love them both SO much! Those candy bags at CVS are definitely hard to resist! the cake looks fabulous! Thanks, Manali! I can’t resist a Snickers ever! I love a good brownie cake. Especially one as pretty as this one! Target is my CVS and it’s astounding how quickly I can go from picking up toothpaste and a birthday card to a cart full of random stuff, lol. I hope the cake class gets better! Exactly. I get so much stuff when I go! Mir, hahah, I LOVE CVS!!! and Walgreens. . all those places . . I walk in for one thing and leave with 15. The cake decorating class sounds so fun! I am so unfamiliar with working with fondant . . I’m sure you did great and good luck with the tiered cake! this is your first one?! My only tip: bake the cakes and freeze them and then assemble and frost the cake when they are cold. And do the crumb coat! I would go to I Am Baker for her tips. Her cakes are always gorgeous! 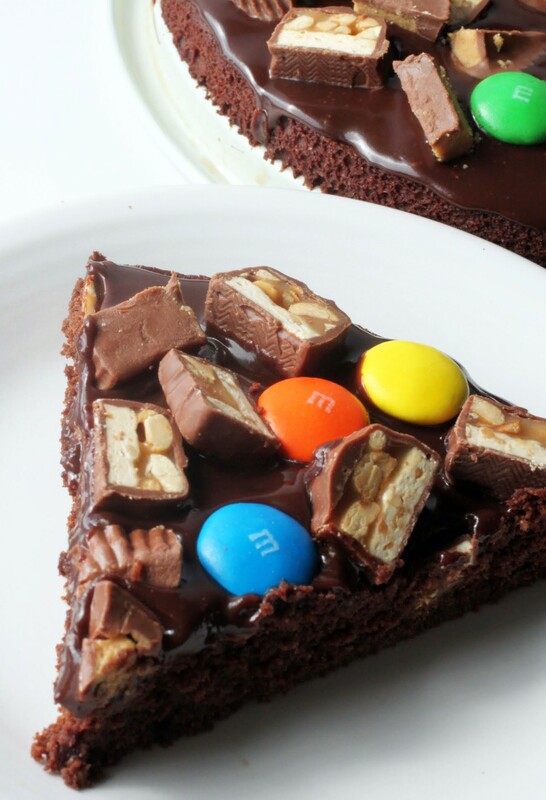 I LOVE this candy bar brownie cake! I would love a slice right now! Alice @ Hip Foodie Mom recently posted…Summer Quinoa Salad + A Video! That’s something I did, because freezing cake makes it easier to carve. And now I’m crossing my fingers and praying that the rest goes well. I’ll check out I Am Baker! annie@ciaochowbambina.com recently posted…Best of Junes! Pottery class sounds awesome too. I want to do that! I’m with you on the fondant, girlfriend. That stuff is pretty, but not very tasty. Thank goodness you picked up all these goodies at the CVS to make this delicious brownie business! Good luck with the cake decorating class! Fondant is like a thick…something. Not a texture I like! Oh, this brownie cake looks good! It’s a great use of CVS/Target impulse buys and for Halloween candy (left over on purpose 😉 ) I am pinning this for now and later! I have always wanted to take a cake decorating class, but haven’t found time…yet. I have been told that fondant is really meant for the eyes not for eating. It’s so pretty, but tastes gross. I’ve made decorations with marshmallow fondant and the flavor is much better, though I totally agree that over handled food is very unappetizing. Thanks, Wendy. You should take the class when you find time. It’s so helpful! But fondant…yeah. Not so great! I don’t like how fondant tastes either! Brownies covered with chocolate candy on the other hand tastes great! Ganache trumps fondant every time!